Million Dollar Band in LEGO Form? What do band kids love more than marching halftime? 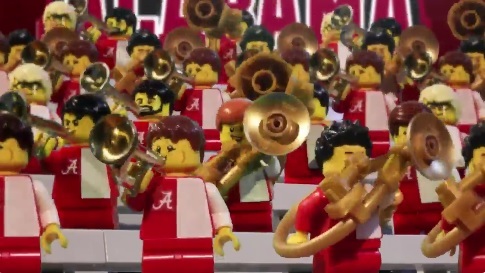 Unfortunately we don't really have control over giving you those things, but we can control is showing you this awesome College Football Championship Game Tradition video produced by LEGO that features the Alabama Million Dollar Band in LEGO form performing "Yea Alabama". This might be one of the coolest videos we've seen in a long time. The video illustrates the folklore of Howard's Rock at Clemson and the "Yea Alabama" fight song at Alabama all in LEGO form. This is a really cool marketing strategy and I must say, I hope this becomes a regular occurrence for football games.